Leonardo's Last Supper and Last Supper Guide Book. This special ticket combination includes the entry ticket to visit Leonardo's Last Supper with the pre-booking service to avoid waiting in line and an in-depth guide book of Leonardo's masterpiece in the language of your choice. Visitors can receive one guide book for each issued voucher (not for each ticket) by presenting a specific shopping card at the bookshop located inside the museum. The shopping card will be send to you by e-mail together with your ticket voucher. Guide Book available languages: Italian, English, French, Japanese, Spanish, German, Russian and Chinese. The Dominican convent close to the church of Santa Maria delle Grazie houses one of the most important works in the world: the “Last Supper” by Leonardo da Vinci. 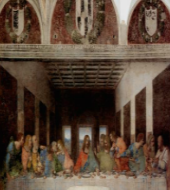 This masterpiece has been painted between 1494 and 1498, during the kingdom of Ludovico Il Moro, and to do that Leonardo adandoned the usual method of the fresco to use a new method called “a secco” (on a dry wall) to paint the Last Supper on the wall of the refectory. However, upon the completation, the fresco gradually declined due to this new techique and to the environment factors and because of that the work has undergone several restorations during the years. The last one has been done in 1999 and many scientific methods have been used to carry over the original colors and to remove, if possible, the traces of previous attemps to restore the fresco. After the last restoration new measures have been decided to protect the fresco. To keep the work at the room temperature, a maximum of 25 people can get inside the refectory every 15 minutes. Buy your tickets and skip the line!